Blimey...I have not done a post in a while! I genuinely miss blogging so much! Finally I am getting the chance to update you guys on my recent trip. I went to Rome for 5 nights back in December. Flew with British Airways from London Gatwick. If anyone is looking for good deals I would highly recommend British Airways website as I felt like I got a great deal! Now where shall I start? So I landed in Rome about 7pm, but by the time I got my checked in luggage and passed immigration it was nearly 8pm. I got the local bus from the airport bus station and paid €4 single. First tip...do not get a taxi, there will be plenty of people trying to stop you while you walk all the way to the bus station after you have come out of the airport and they will convince you if you pay €30-€60 they will take you right outside the hotel. Seriously for that price it is not worth it. There is also an express fast train which is about €14 single, you could go for that option as it only takes half an hour to get to Termini Train Station, however as I wanted to save some money I went for the bus option which took around 45 minutes to get to Termini Station. If you are going to use the bus make sure to buy a return ticket as it works out cheaper - €6-€7. Once we got to Termini station, it was about 9pm. It did not feel unsafe at all as plenty of people were still out. We already had researched before we left England how to get to the hotel via walking. We were staying only 10 minutes walk away from the Termini Station therefore did not feel the need to get a taxi. I found the people in Rome to be very helpful! We did have to stop and ask how to get to 'Via Venti Settembre' as that was the road where our hotel was located. I had already pre looked up how the hotel looked from outside online so when we were walking on the road I could recognise it instantly! I highly would recommend staying in Seven Kings Relais on Via Venti Settembre if you are visiting Rome. The hotel was great, clean and staff had great local knowledge. It was basic but it had everything you would need including WIFI. Make sure to wake up early and make the most of your time no matter how tired you may feel! So as I had done some research beforehand and already had everything planned out, I knew we were heading to see the Colosseum and The Roman Forum. TIP - If you enjoy walking do not buy a travel card I think they cost about €34 per person for three day travel and allows you into two sight seeing places of your choice from the list. You can use the metro line and local buses and I can see this being very popular for tourists and mostly for first time travellers to Rome like myself. I was going to purchase it however I knew if I used the metro I would be missing out on seeing so much more and would only be seeing the main attractions. I therefore decided to walk. We got a handy tourist map from the hotel and there are street names at the end of each street so we were off! If your a student make sure to carry your student card and ID as you do get some good discounts at these sight seeing places. So to save money make sure you don't eat near Colosseum or any tourist attraction places...walk away from the tourist restaurants and visit somewhere like a cafe which does authentic Italian food and without a doubt not only will you be saving money but you will enjoy it more too. After checking my iPhone's health app it turned out we had walked 25km or more each day! I being myself decided to wear Heeled boots on the first day, girls just don't! I lived in trainers for the next a few days and it made my sight seeing a lot more enjoyable! Here are some pictures from my trip. 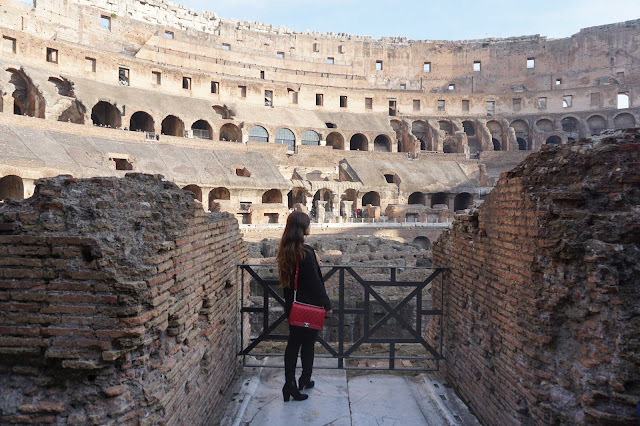 There are plenty of things to do in Rome and even though I went in December it was 17-20 degrees throughout my duration! I was very lucky indeed! Make sure to leave early, as trust me time flies! As we went in winter it was obvious it would get dark earlier therefore we knew we had to leave early no matter what. Tip - If you are on a budget, find out where your local supermarket is, we found one about 5 minutes walk away from the hotel towards Termini Station and brought fruits, snacks, breakfast bars and water bottles. This saved us a lot of money because we weren't going to the restaurants to eat all the time. We only went to cafe/restaurant during lunch and dinner times. Don't always go to the first restaurant you see, walk around and look at what they all have to offer! Near Termini station is where there are plenty of cheap places to eat. Don't go for the usual McDonalds or KFC, try something new! Make sure you visit every Church you go past. The Churches in Rome are incredible and stunning inside. Every building has a history and memory. Also bare in mind if your visiting in winter the opening hours for most tourist sites, as some close early. Would I recommend Rome? Without a doubt yes! For me it is on level with Paris, and people who know me know that I love Paris! I would definitely love to go again! Also don't forget to try their most popular ice cream - Gelato! I hope you have enjoyed reading this post and if you are going to Rome hope you have a lovely time! And if you haven't...then what are you waiting for? It is absolutely beautiful! Don't forget to leave me a comment and let me know your thoughts! Disclaimer - This is not a sponsored post, I paid for everything myself.